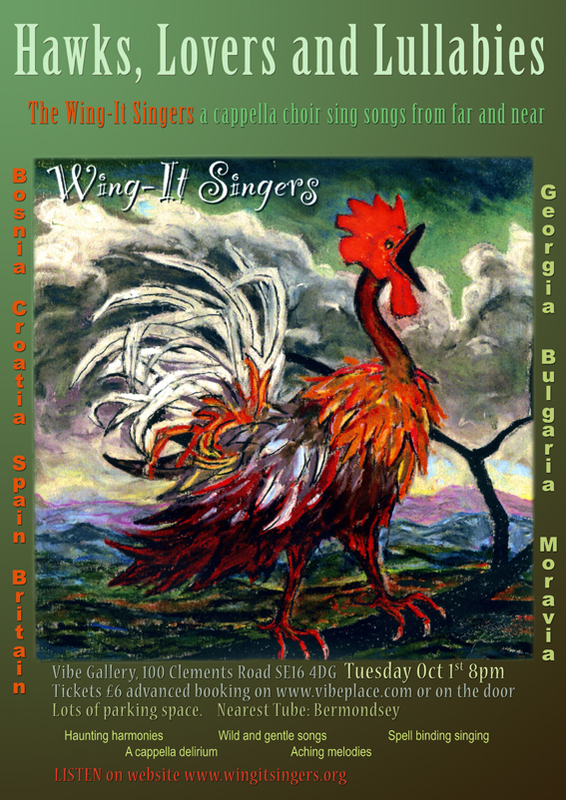 The Wing-It Singers will be performing at the Vibe Gallery on Tuesday 1st October 2013, as part of the Bermondsey Arts Festival. Tickets are £6 – you can either get them in advance from the Vibe Gallery, or pay on the door. The concert starts at 8pm. Nearest tube: Bermondsey; plenty parking too. This entry was posted in Concerts, Events and tagged a cappella, bermondsey, bosnia, Britain, Bulgaria, choir, choral singing, concert, Croatia, Georgia, gig, moravia, music, singers, singing, Spain, Vibe Gallery on September 23, 2013 by wingit01. South of the river on Saturday! The Wing-It Singers will be venturing South Of The River (eek!) next Saturday 8th June. As far as we know, we will be singing at 12.45 and and 13.45. And it looks like the weather will be fine. So dig out your sunglasses, come and listen! It’s free, and pretty informal – you can wander in and out as you feel like it, and enjoy the gardens. This entry was posted in Concerts, Events and tagged choir, Chumleigh Gardens, concert, london, Open Squares, singers, summer, Sunday, weekend on June 5, 2013 by wingit01. 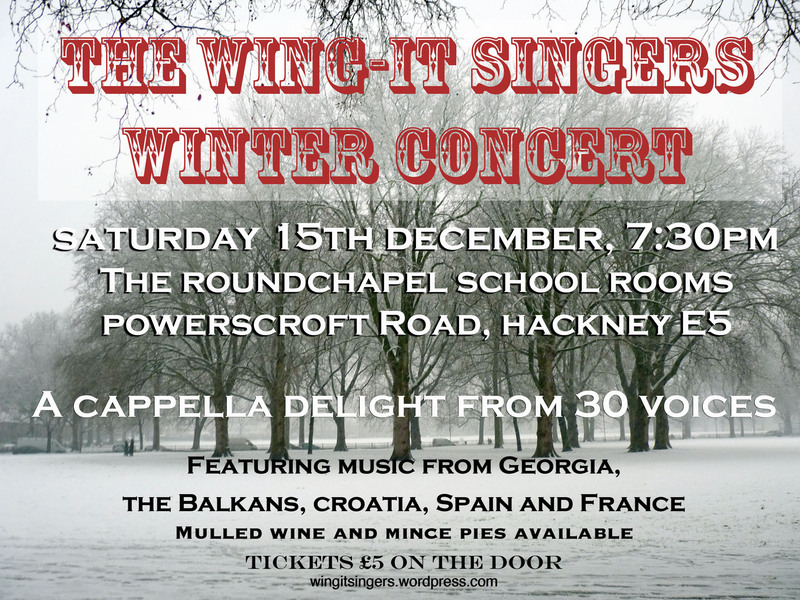 The first of this year’s Wing-It Singers’ ever popular winter concerts. Acappella delight from 30 voices to fill the ancient and atmospheric space of St Mary’s Old Church, featuring music from Georgia, the Balkans, Spain and France. This entry was posted in Concerts, Events and tagged choir, concert, festive, hackney, singers, st mary's old church, stoke newington, winter on November 8, 2012 by wingit01. A glorious feast of seasonal music, with festive food & drink. 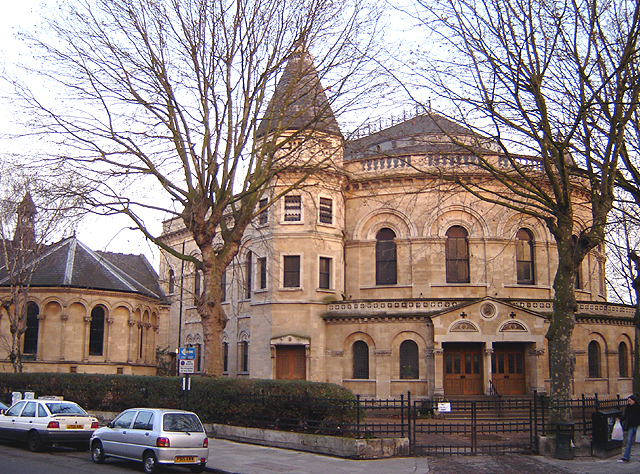 This entry was posted in Concerts, Events and tagged choir, concert, festive, hackney, round chapel, singers, winter on October 26, 2012 by wingit01.